Description: The North American Collection is an assortment of 6 Puffalumps that were sold to retail stores for resale. The assortment includes two different colored rabbits, two cows, a bear cub, and a pig. The pink rabbit, the white cows and the bear cub were introduced in the very first Puffalump Assortment, 1986's #8000 Puffalumps Assortment. The "new" Puffalumps in this assortment are the yellow rabbit and a new purple pig! The pig was only made for one year. 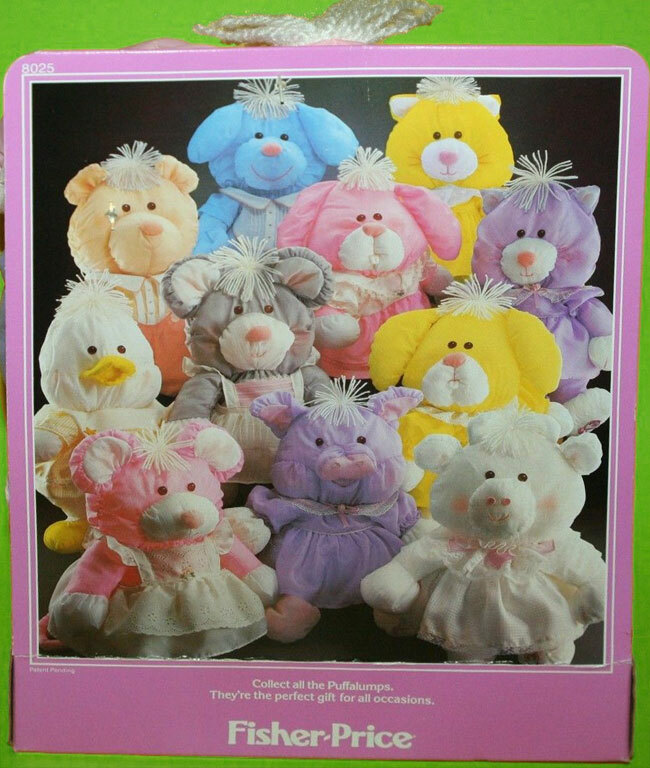 Each Puffalump in this assortment was sold with a removable outfit. The white cow wore white dress in 1986, but she wore a white and purple checkered dress in this assortment. 2 each - #8001 Cow - White cow wearing a purple and white checkered dress with 3 pink hearts on the collar. #8004 Bunny - Yellow bunny wearing a yellow dress with a white scappoled eyelet collar. #8015 Pig - Purple pig wearing a purple dress. Also see 1986's #8000 Puffalumps Assortment. Also see 1987's #8020 North American Collection.